LOUISVILLE — The Presbyterian Mission Agency Board (PMAB) voted unanimously today to ask General Assembly 223 (2018) meeting in St. Louis this summer to confirm its election of the Rev. Dr. Diane Moffett to a four-year term as president and executive director of the Presbyterian Mission Agency, one of the six agencies of the Presbyterian Church (U.S.A.). Currently the senior pastor of Saint James Presbyterian Church in Greensboro, North Carolina where she has served since 2005, Moffett is also the moderator of the Executive Council of Salem Presbytery and was previously moderator of Salem Presbytery. Current PC(USA) Stated Clerk, the Rev. Dr. J. Herbert Nelson, II, also served as pastor of Saint James several years before Moffett’s arrival. Following a nearly three-year absence in settled leadership for the PMA, Moffett is positioned to take the helm of the agency that has been the focus of many of the reforms suggested by the Way Forward Commission and All Agency Review Committee, including the restructuring of the corporate entity, known as the A Corp, of the denomination. Moffett, 59, began ordained ministry in the PC(USA) in 1987 at Elmhurst Presbyterian Church in Oakland, California. 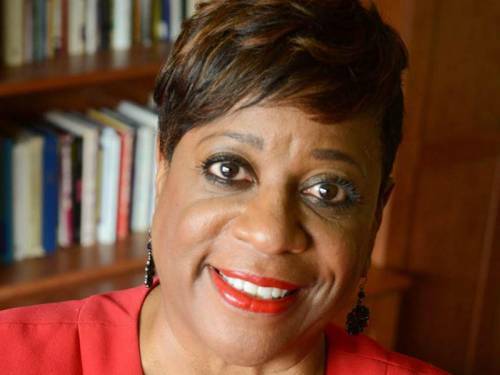 She also served in reconciliation efforts following the Rodney King riots, as executive director of Harbor House Ministries in Oakland, and as associate pastor of Elmwood United Presbyterian Church in East Orange, New Jersey, prior to moving to Greensboro where last year she made a bid for mayor. PMA Board member Shannan Vance Ocampo called the nomination “an exciting and bold choice” and extolled Moffett’s experience as a community organizer, church revitalization leader and nonprofit business innovator. Moffett will assume leadership of the Presbyterian Mission Agency on June 11, 2018. Her appointment is subject to confirmation by the 223rd General Assembly, which meets in St. Louis on June 16–23, 2018. Hailing from a family of musicians, she is married to Mondre Moffett, a trumpeter and professor of black music studies at North Carolina Agricultural and Technical State University who previously played with the Duke Ellington Orchestra. They have three daughters: Eustacia Moffett Marshall, an ordained minister in the Presbyterian Church (U.S.A.); Jessica Moffett-Lee, an elementary school teacher in West Orange, New Jersey; and Kayla Moffett, an elementary school teacher in Newark, New Jersey. You can read the search committee report and announcement from the Presbyterian Mission Agency Board, along with other biographical information on Moffett, at this link.